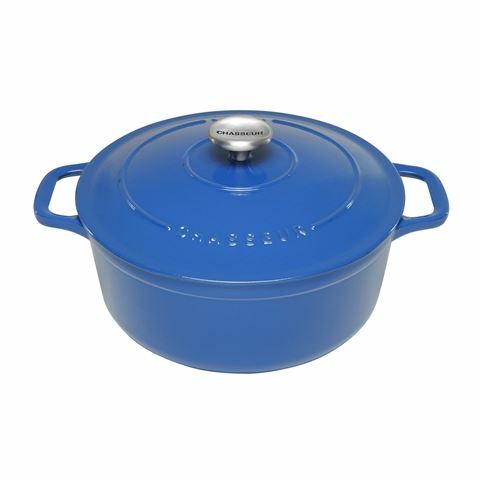 Anyone who truly appreciates the art of fine cuisine will love Chasseur cookware. For the last seventy-five years, Chasseur has been made in Doncherry, within the French Champagne Ardenne region, known the world over for its food and wine. With this in mind, you just know that Chasseur will help you to prepare the most gourmet of meals. The recipe for Chasseur is pretty simple – just take a strong, heavy core made from cast iron, and then add two coats of enamel. The first coat seals your cookware, protecting it from corrosion, while the second, coloured coat not only makes your Chasseur cookware easy to clean – it also gives it its distinctive, colourful finish. Cookware has never looked so good! Chasseur’s cast iron core absorbs heat quickly and efficiently, and distributes it evenly over the entire surface of the cookware – on just about any heat source. From the oldest wood fire oven to the most modern induction cookware surfaces, Chasseur can handle it all. Made in France from double-enamelled cast iron. Enamelled finish is durable and easy to keep clean. Heavy lid seals in flavour and moisture. Suitable for use on all cooktops. Requires low to medium heat only. Use only with wooden or plastic cooking utensils.